Do you suffer from dull and lifeless skin? Despite doing the cleansing, toning and moisturizing routine, do you notice that you have blackheads and clogged pores. Well, what you need to do is to invest in a good scrub or exfoliant that will gently slough away your dead cells, clear the clogged pores and give you soft and glowing skin. That way, you do not have to wait for your next salon appointment to get a good scrub. Do it once or twice a week and your black heads and dead skin are taken care of. A quick scan of your supermarket shelf will reveal tonnes of options for skin exfoliants. If you are confused as to what to pick, we tell you the top 10 skin exfoliants in India to make your choice easy. This Neutrogena Scrub is rich in Salicylic Acid which helps root out dirt and grime from the pores. It gently exfoliates the skin without drying it out, making it perfect for daily use. Regular use prevents the occurrence of blackheads. 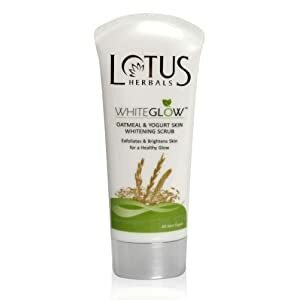 It is priced at Rs.129 for 40 g.
The oatmeal in the scrub helps in clarifying the pores and eliminating the blackheads. The yogurt gently cleanses and whitens the skin and leaves it soft and supple. Use it once a week to get glowing skin. It is priced at Rs. 185 for 100 g.
This scrub is made of natural ingredients like papaya, methi, neem, banana and turmeric. It gently exfoliates the skin, removes impurities that clog pores and prevent acne from occurring. The papaya and banana nourish the skin and help it glow. It comes in an 85 g tub, priced at Rs.199. Neem is an antiseptic that is used to prevent oily skin and acne. The Himalaya Neem Scrub is enriched with natural neem, lemon and apricot kernels. They help in clearing the pores, controlling excessive oil and fighting acne causing bacteria. It is priced at Rs. 115 for a 100 g tube. 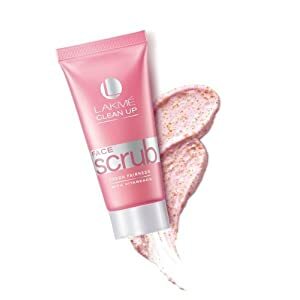 This scrub from the Lakme Clean Up range will give you salon like scrubbing at home. It comes enriched with walnut and cornmeal that clear the pores from within. The Vita Beads – Vitamins B3, E and C help lighten the skin tone. It is priced at Rs. 225 for a 100g tube. 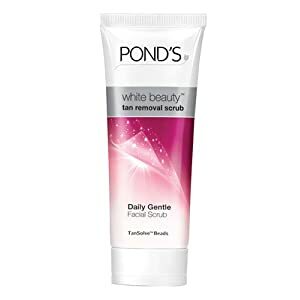 Pond’s white beauty tan removing scrub promises to fight one of the major skin issues we face – pigmentation from tanning. The scrub comes with tan solve beads and 50% brightening cream. Regular use removes the tan and whitens the skin tone. It is priced at Rs.150 for 100 g.
Everyuth Walnut Scrub is among the most popular scrubs in the market because it does one work best- scrubbing. No other frills. Just strong walnut beads that help remove all the dead skin and dirt from the face and body. It is priced at Rs. 105 for 100 g.
The invigorating coffee scrub when used on the face helps slough off dead skin. It improves circulation and reveals a glowing skin underneath. It is rich in antioxidants that help give skin an instant glow. Price Rs. 695 for 125 ml. This scrub comes with an innovative scrublet which is like a face sponge with a brush that helps exfoliate the skin. The product needs to be poured on the scrublet and worked on the skin. It makes the skin instantly brighter and softer. It is priced at Rs. 399 for 178 ml. 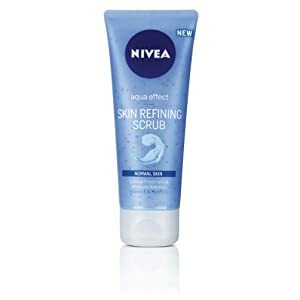 This scrub with its micro beads helps make the skin thoroughly refined and exfoliated. It is enriched with Vitamin E and hydra IQ that make the skin supple after use. It is priced at Rs. 149 for 75 ml.